Transition Day takes place in August. However, new families should still complete these steps. Complete our Annual Online Digital Signatures: This year, we are introducing a new and improved online platform, Registar. This new platform allows parents and students to quickly and efficiently review and agree to our policies in order to have access to technology, participate in gym class, as well as other required annual policies. Each student needs to have a completed digital agreement on file. Parents should create a new account on this system using a valid email address. Then, you will add your students under "Student Registration." Parent and student should be present when completing this as there are digital signatures needed. Please print your confirmation email for your records and bring a copy to Transition Day. There is a sample email graphic on the right of this page. Complete Digital Signature for each student - REQUIRED! Please bring confirmation email receipt to Transition Day. Emergency Card: New this year, parents will be able to add emergency contacts on MiStar ParentPortal. Login to the ParentPortal to complete the emergency contacts. Instructions will be available on the login page. Yellow emergency cards will be printed with your demographics and emergency contacts prefilled. You will receive this prefilled card for signature in your Transition Day packet. Please review and confirm auto filled information and return on Transition Day. Supplemental Materials Donation: Please complete this form if you are entering 6th or 7th grade. 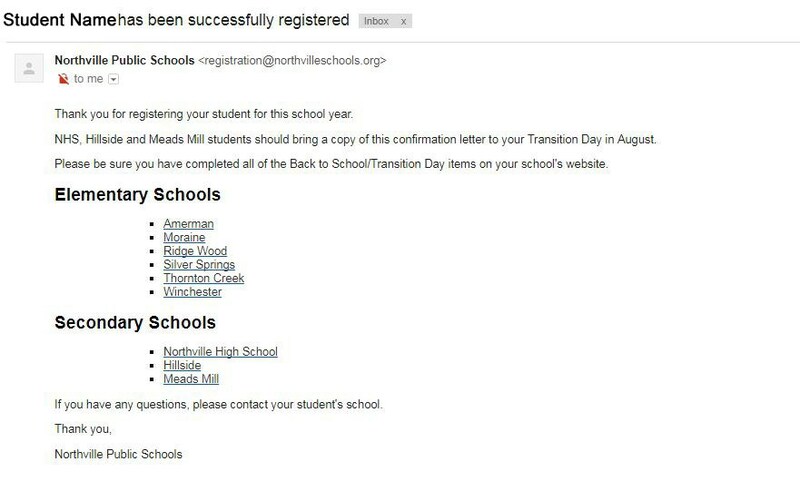 If you have not enrolled in Northville Public Schools yet, please visit our Register/Enroll page and complete the enrollment process for Meads Mill Middle School. Medical History and Physical Form: All students must have a current physical on file to participate in middle school athletics. A current-year physical is one given on or after April 15 of the previous school year. Pay to Participate: Because of restrictions by the Michigan High School Athletic Association, the governing body of athletics for middle schools and high school in the state of Michigan, interscholastic athletic competition is only available for 7th and 8th graders. However, there are many activities that 6th graders may participate in and some of these are athletic. *All of the above forms are available on the Northville Public Schools Athletic Department page.